The NY Lizards Dancers will be hosting a 2-day clinic this summer and we want to dance with you! Learn just what is takes to be a professional dancer straight from our 2017 NY Lizards Dance Team and perform with them center field in front of hundreds of loyal New York Lizards fans and all of your friends and family at our final home game of the season! 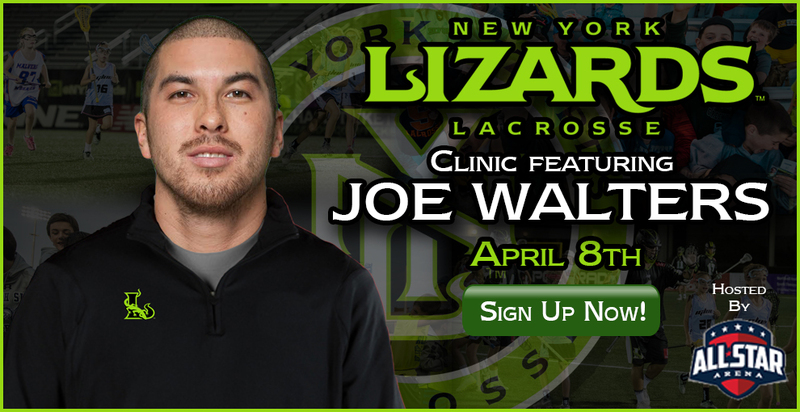 Come join the New York Lizards and MLL All-Star Joe Walters for his Lacrosse Clinic on April 8th! Registration will include 2 hours of instruction by Joe Walters, an Autograph & Picture after the clinic concludes as well as a Game Ticket to any 2017 New York Lizards home game. Space is limited, secure your spot while you can. As always don't forget to bring your game faces! With the Major League Lacrosse season right around the corner, the New York Lizards hosted their first annual Big Chill Shootout. The 4 on 4 style tournament consisted of teams from all over the Tri-State area and as far as Albany, NY. The tournament was divided into two divisions: one included grades 3 and 4, while the other included grades 5 and 6. Each team was to play to play three games, with the championship game hosting the top two teams from each grade group. The games held the same rules as regular lacrosse, but instead were only 25 minutes in length with a halftime around the 13-minute mark.